As we move into the Summer holidays, can I tell you about a fair number of exciting developments afoot for St Mary's? Firstly, we are moving full steam ahead with developing our buildings; we’re in the process of selling Defoe Hall and that is likely to all be complete by the Autumn. Sadly that means Hackney Foodbank’s Distribution Centre which we presently house, is needing to find alternative accommodation as are the other community church groups who presently use the building. As I’m sure you are aware we are looking to use the proceeds from that sale to re-build the rooms adjacent to the New Church as these spaces are no longer adequate for the church nor for the many community groups that use them. The ‘Blue-Sky’ Group, set up to work on this project, has had many fruitful and inspiring discussions with the Project Manager and we are now at the point where the PCC can appoint an architect. Alongside that we’ve just heard that we were successful in our bid for money from the ‘Listed Places of Worship’ Fund and have been awarded £92K to do some of the much needed work on the Old Church. Of course there’s still much to do (not least the roof of the New Church) and all will take time, money, effort, goodwill, and faith! But when completed we hope that St Mary's with its two beautiful church buildings and redesigned flexible meeting spaces, will be better able to serve the needs of the parish and work more creatively with our partner organisations. Other changes are less about buildings, more about people. We announced at both our main services yesterday that Matt, Sarah and Bekky will be leaving us as Matt has been appointed Team Vicar at St Nick’s in the Poplar Team Ministry. Of course, we knew Matt would be offered a post at some point soon as he’s in his final year of training and the good news is that the family won’t be moving on until mid February. Roxane Liddell - a regular worshipper at our 9.30 service and a member of our PCC - will be leaving us in September to begin training for ordained ministry. Roxane and Kaleb, her son, will be moving to Cambridge where Roxane will be taking up a place at Westcott Theological College to begin her two year ministerial course. We wish her and Kaleb every blessing. And finally, lots of people are asking me what I’m going to be doing on my sabbatical! In September it’s my intention to walk the ancient pilgrimage route across northern Spain, to Santiago de Compostela. Following that, I intend to do some study in the area of ‘Authentic Leadership’. Then in November I will be returning to the Theological college I studied at many years ago in South India before taking the train right to the north of the country, finishing in Varanasi, the sacred Hindu city. All being well, I’ll be back at St Mary’s on November 28th in time to celebrate Advent with you. 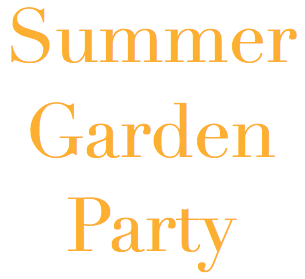 Wishing you a lovely Summer and if you’re around don’t forget the Garden Party on the Rectory lawn on August 21st! Love London. No place for hate. 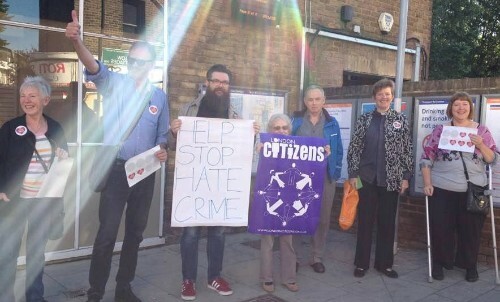 St Mary's representatives joined with Citizens UK campaigners across London at rail and underground stations in an act of solidarity with communities affected by a recent reported rise in racist and xenophobic abuse. Read more here. Headlines on the Hackney Citizens action to settle a small number of Syrian refugees in Hackney. First family resettled. Huge thanks to everyone for donating items (people donated things from almost every institution in Hackney Citizens), cleaning the flat and befriending. Befriending training on 11th July at the Alevi Cultural Centre. Difference between Local Housing Allowance (LHA) and market rent in a year is about £5k. Institutions are currently fundraising to sponsor a family to come over. 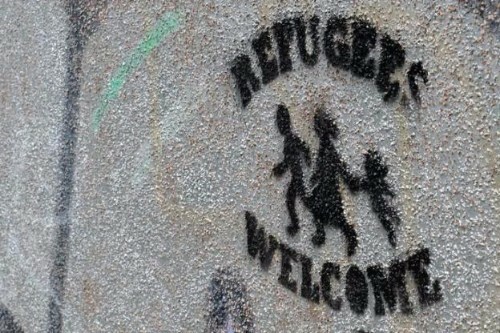 Refugee Action provide first three weeks of intensive support and then we appoint people to befriend. Challenge: finding landlords willing to lease their properties for LHA rather than market rent. There is lots to celebrate but we've got to keep the momentum up! The feminine and social change. What does the feminine principle have to teach us about peace-building, environmental work and social change movements? A one-day workshop for women facilitated by Clare Martin, a member of our All Age congregation, at St Ethelburga's in the City, 10am-4.30pm, 23rd July. More details here. St Mary's provided space and a place to acknowledge feelings, recognise hopes and commit ourselves to moving forward together in the week after the referendum. The Epiphany Chapel was set aside for individual reflection and there was a small gathering in the Old Church on Sunday 3rd July to reflect and listen to each other. Volunteers and food/grocery items are needed for the Hackney Foodbank. Please speak to Lizzie or one of the clergy after a service to find out more. The items needed are quite specific, so if you'd like to help local people then please donate only items from this list and bring them to church with you. Weather permitting, there will be music and outdoor games for all to play! Please bring along a dish to share. So we don't have lots of one thing a suggestion sheet is available to choose from after the Sunday services. Soft drinks will be provided and Pimms if you fancy! Please bring along any other drinks you might like on the day. If you are able to help with any of the organisation please email Emily or Roxanne. We hope the sun will be shining and lots of you from each congregation are able to attend. In a week or so we'll be having a major clear out at St Mary's. If you've got anything hanging about anywhere at church please take it away over the next few days. Anything left will probably end up in the skip. 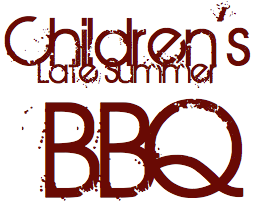 In the Rectory garden on Saturday 10th September, from 5-8pm. This was a lovely event last year, connecting the families of St Mary's. All children and their parents/carers are welcome. There's no cost - just bring a plate of food to share and something to drink. More details (and hopefully sunshine) to follow! for the summer and beyond. During August there won't be an All Age service at 9.30am on Sundays. So many people are away that we end up looking a bit sorry for ourselves. Don't forget though, everyone is welcome at the 11am Sung Eucharist in the big church no matter what age you are. There are things to keep children occupied if they get bored (books, toys, drawing equipment), so please join us at 11am during August. If you are a child and you like singing then join the choir for the Patronal Festival. You'll need to be at a practice at 9am on Sunday 4th September (before the All Age service) and then at the joint service the next week. On the second Sunday of September (11th) we will hold a joint service at 10.30am where all three of our Sunday congregations will worship together in the big church. This will be our Patronal Festival when we celebrate the life of St Mary and the life of St Mary's. Breakfast Club will resume on 9th October. Copyright © 2016 St Mary, Stoke Newington, All rights reserved.